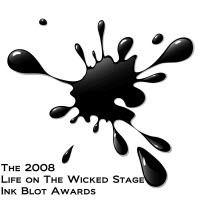 In preparing for The Second Annual Wicked Stage Ink Blot Awards, I realized that it would be tough to write anything better about my motivation for creating them than I did in year one. What I wrote then is still more than an appropriate chronicle of my thoughts and feelings. 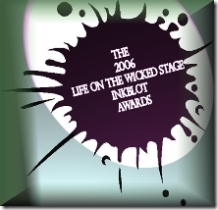 I created The Life On The Wicked Stage Ink Blot Awards as a celebration. Yes, it's a celebration of the 1 year anniversary of this blog. But it is more than that. It is a celebration of a community that I have come to know and admire. The Tableteers that make up the Tablet PC Community are an amazing collection of individuals who know and work with the Tablet PC platform. They are fiercely protective of it, insatiably curious about advancing it, very intelligent, often wickedly funny, at one time very forgiving and patient, and in the same breath, scathingly critical when the need arises. They are also exceedingly willing to evangelize the platform to anyone who will listen, and in my humble opinion, have helped keep the spotlight on The Tablet PC in ways that may, in the long run, prove to be responsible for keeping the platform thriving. That all remains true, certainly, but the Tabletscape, like everything else, has evolved in a year. It actually has a name, The Tabletscape coined by James Kendrick. It now includes not only Ultra-Mobile PCs, but more things mobile. Ink is now side by side with touch. Those changes will continue and I hope we will continue to see growth. In the last year, we’ve witnessed the invasion of the Down Under Tableteers. Marc Orchant, while still occasionally blogging about Tablet PCs, now is an exec at Foldera and a blogger on ZDNet blogging about all sorts of productivity categories. Kevin Tofel has joined up with James Kendrick, the All Father of Tablet PCs, and they have formed a formidable team on jkOnTheRun. Tablet PC Buzz has had its ups and downs (it is down again at present, sadly) and we’ve seen a rash of new sites and new folks covering the UMPC market. (Is there a site anywhere that CTitanic is not writing for?) Podcasts (should we use that word?) and video reviews are a part of the scene in a big way, and I have to say, I really enjoy doing and watching the Inkshows we provide at GottaBeMobile.com, which has become a real and invaluable resource for the community and a new home for me. At launch last year, multiple Ink Blot Award winner, Mark Sumocat Sumimoto quickly nicknamed them The Blotties, which seems more than appropriate. So whether you call them the Blotties, or Ink Blot Awards, it makes no difference as to the fun I hope you have with the list. As before, there are no rules for inclusion, save my own. Recognition here comes simply from things that struck my fancy, or I think merit attention for one reason or the other. Yes, there are some "Best of Breed" awards here, and yes, there are some that are included just for the pure fun of it. Perhaps there are one or two included for ignominy as well. Who knows? Whatever the reason, I congratulate those who received a Blottie, (or is that those who were blotted) and look forward to the day that we can perhaps have this little celebration while getting blotto over the Blotties. So, sound the trumpets, cue the drum roll and the dancing girls. Take the jump and enjoy The Second Annual Life on the Wicked Stage Ink Blot Awards. Yes, it is probably too early to be retiring a few awards, given that this is only year two of the dang things, but what the hey, no one is going to top these anyway. Best Example of How Not To Set Expectations Too High So As Not To Give Your Product A Black Eye Out of the Chute While Forgetting to Talk About Key Points Like Why UMPCS Don't Come With Keyboards: The Team Who Launched the Origami Viral Campaign.